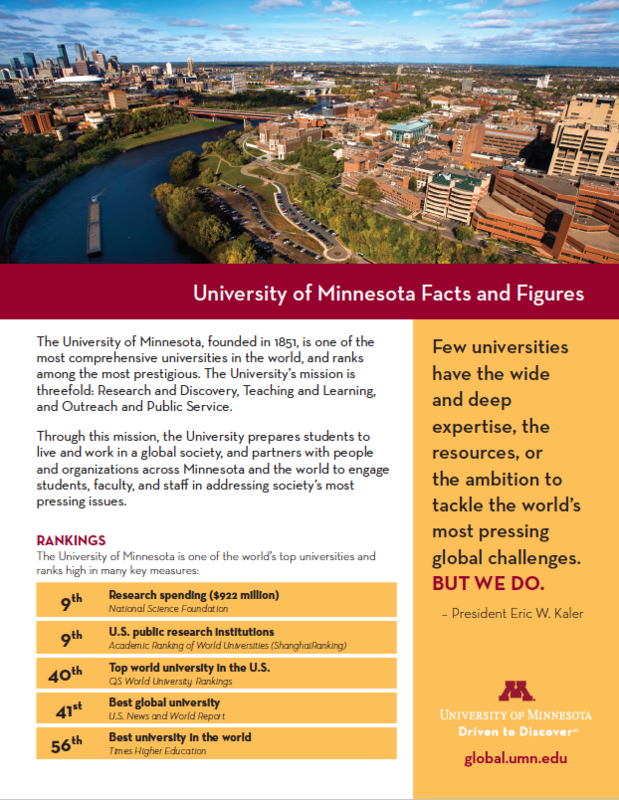 The University of Minnesota is a recognized leader in education abroad and in hosting international students. Open Doors is an annual report that provides statistics on study abroad participation by U.S. students and international student enrollment at U.S. institutions. The report is published by the Institute of International Education (IIE) in New York, with support from the Bureau of Education and Cultural Affairs at the U.S. Department of State. The Twin Cities campus ranked 9th among research institutions in numbers of students sent abroad on credit-bearing programs in 2016-2017, with 2,576. The Twin Cities campus ranked 21st among research institutions in international student population with 7,212 students in 2017-18. From its earliest days, the University of Minnesota has been international both in vision and in fact. Learn more about our international history. The GPS Alliance produces an overview "facts and figures" brochure with information for international visitors. The brochure is updated each fall. The latest version is from Winter 2019. Hard copies are available for free to departments. Send requests to global@umn.edu.